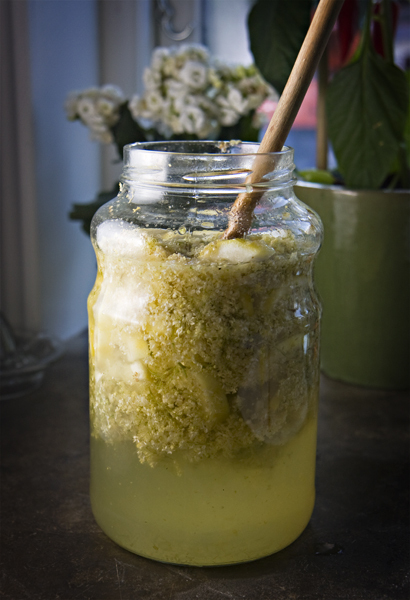 Of all of the lovely things I’ve learned in Denmark, making hyldeblomst saft (elderflower cordial) is one of my favorites! 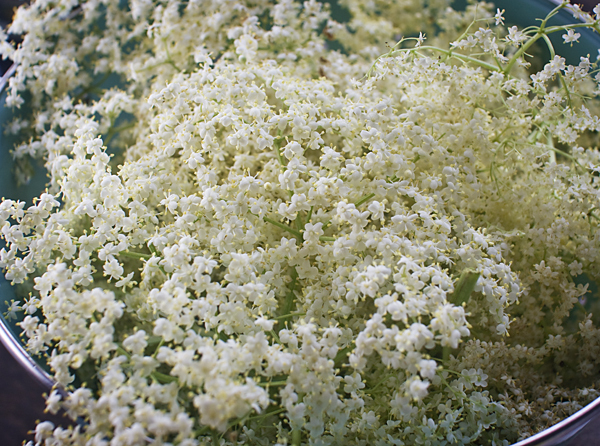 Elderflowers grow wild here, and in June, it’s common to harvest them and make a syrup, which can be mixed with water or soda for one of the most delicious drinks I’ve ever tasted. It’s even on café menus. Shake the bugs out of the flowers… yep, this is an “earthy” one :) Trim the flowers so that there’s as little stem as possible remaining; too much stem will give you a bitter syrup. Give the flowers a very quick cold water rinse. Traditionally, they just shake the bugs out of the blossoms, but I’m American and we can be a bit obsessed with cleanliness (or so I’m told), so I rinse my flowers enough to make me feel better, but not so much that I rinse away the pollen. Add the blossoms to a large jar, bowl, or pot. Set a kettle to boil. 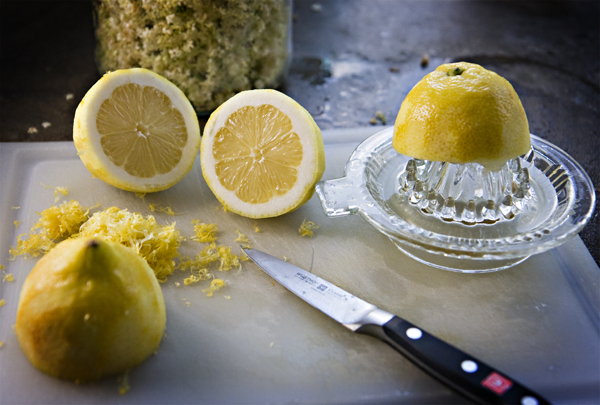 Cut the lemons into thin slices and arrange them over the blossoms. Sprinkle with the citric acid and sugar, then add the boiling water. Stir, cover, and set it to rest in a cool room, or fridge. Let it hang out and steep for the next 3 days, just remember to stir it once in awhile. On the third day, strain it through cheesecloth or a very fine strainer, I used my yogurt cheese maker. Then store it in the fridge. To make it last longer, you can process it in a water bath canner. I mix 2-3 tablespoons with a glass of water or sparkling water. I think the Danes use a slightly weaker ratio, but this is a “to taste” sort of a situation. 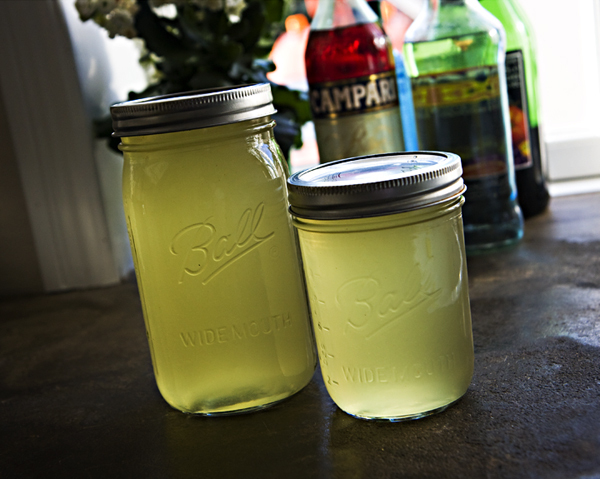 If you’d like a more adult beverage, add a tablespoon or so of syrup to some champagne, vodka, or gin, or try this gin & elderflower cocktail recipe :) Skål! I’ll have to go look at my blossoms, if there are any left, but after putting this on my calendar in spring for two years in a row, I discovered that my elderberries are different from most folks that actually use elderberry. Mine are red and nasty, not to mention toxic. Your’s probably turn into the beautiful blue elderberries. It sounds like such a nice syrup. I’ve resorted to going with English lavender instead. I can do that one!